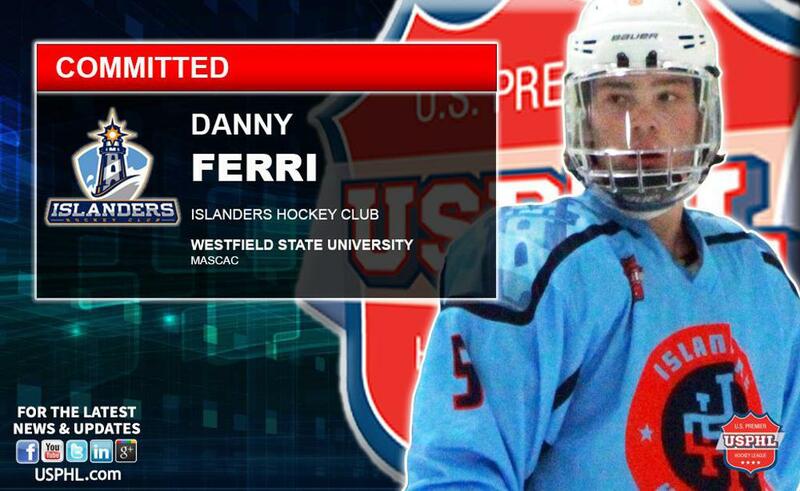 North Andover, MA – Danny Ferri from Chelmsford, MA has decided to take his academic and hockey career to the western side of Massachusetts where he will attend Westfield State University next fall. Danny is the 2nd IHC Elite player to make his college decision. He’s currently leading the Islanders Hockey Club Elite squad in total points as he’s accumulated 19 goals and 18 assists for 37 PTS in 26 games. “I am really excited about my decision to play for Westfield State next season. I want to thank my parents, all of my past coaches and past & current teammates as well as Coach Tim Kyrkostas for helping me develop and to get to this point. Playing for coach Tim Kyrkostas and the Islanders Hockey Program has been one of the best decisions that I have ever made in my hockey career. I have never played for a coach who genuinely cares about each of his players. He pushes all of us hard every day because he wants to see us all reach our fullest potential. I am happy to now simply concentrate on the rest of the season as I believe we have a great team and a great shot at winning the league title said Ferri”. The Islanders Elite team currently sits atop of the USPHL Elite Northern Division with a 26-2-0 overall record. The IHC Elite’s return to action this weekend in the USPHL winter showcase as they square off on Friday January 6th vs Potomac Patriots at 12 pm and then the Palm Beach Hawks at 7 pm.